Surin (Thai: สุรินทร์, [sù.rīn]; Northern Khmer: ซเร็น, [sren]; Kuy: เหมองสุลิน) is one of the northeastern provinces (changwat) of Thailand. Neighboring provinces are (from west clockwise) Buriram, Maha Sarakham, Roi Et, and Sisaket. To the south it borders Oddar Meancheay of Cambodia. Surin covers a total area of 8,124 km2 (3,137 sq mi) from the Mun River in the north to the Dangrek Mountains in the south. The capital, Surin city, in the western central region province is 434 km from Bangkok. The area of present-day Surin has long history of human settlement which dates back to prehistoric times. Historically the region has been ruled by various powerful kingdoms including the Angkorian Khmer Empire, the Lao kingdom Lan Xang, and the Thai kingdom of Ayutthaya. Reflecting this history as part the greater geo-cultural area of Thailand known as Isan, Surin is ethnically diverse. The primary language is the Isan dialect of Lao. Speakers of Central Thai account for a small minority while nearly 50% of the population are ethnic Khmer. The remainder are speakers of various Lao languages and small tribal groups such as the Kuy and Nyah Kur. The northeast provinces have traditionally been isolated, both physically and culturally, from the rest of Thailand and Surin is no exception. The vast majority of the province is rural and relatively poor. There is little industrial development with rice farming being the primary industry. Rice farmers supplement their income by cutting sugar cane, as construction laborers, or working in the local silk weaving trade. Elephant capture and training is also an important industry in Surin. Approximately 25 percent of all the elephants in the kingdom are raised in Surin, predominantly by the ethnic Kuy people. Tourism is also important to the Surin economy. 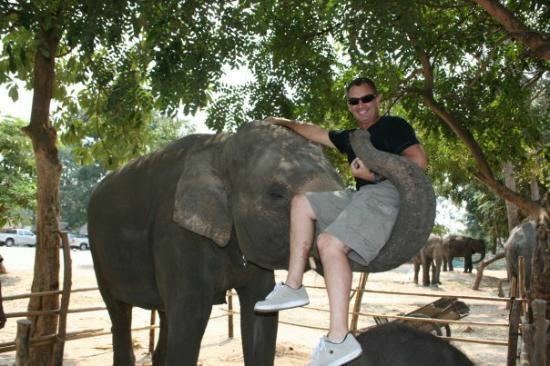 Elephants and scenery are increasingly seen as potentially lucrative by the provincial government which has attempted to make Surin a popular destination for international ecotourism. Domestically, Surin has a reputation for its fine silk and silver beaded ornaments produced in tourist-focused villages such as Khwao Sinaring Handicraft Village. Local traders also conduct cross-border commerce with Cambodians through a border crossing at Chong Chom, 70 km south of Surin city. According to legend, the province was given its current name in 1786 in honor of its royal governor, Chiangpum, whose royal title was Luang Surin Phakdi. The Surin portion of the title is a compound of two words, สุระ and อินทร์, derived from the Sanskrit words sura (Devanagari: सुर), meaning god (cf. Asura), and Intar (Devanagari: इन्द्र), Indra. Prior to the fourteenth century, the area of was ruled by the Khmer empire as part of the province of Kok Khan (Khmer: គោកខណ្ឌ). The name of the region during the period after the fall of the Khmer Empire until acquiring its current name has been lost to history. Surin lies at the center of the southern edge of the Khorat Plateau, a relatively low-lying interior region isolated from the rest of Southeast Asia by surrounding mountain ranges. The south of the province is dominated by the Dongrek mountain range, the escarpment of which demarcates the watershed boundaries and also forms the international border with Cambodia. The mountains, averaging approximately 500m in elevation, are not particularly high but the southward sides are steep cliffs rising rather abruptly from the northern plains of Cambodia significantly hindering any attempt at passing. The main pass in the region is in Surin and cuts through the mountains between Chong Chom and O Smach, Cambodia. The northern face of the mountain range slopes gently down leveling out into the rolling flood plains that make up the central and northern regions of Surin. These areas are drained by small meandering streams which run roughly south-to-north and drain into the Mun river, which cuts through the extreme north of the province flowing east to eventually empty into the Mekong. As the third longest river in Thailand and second largest by volume of water, the Mun has been important in the region since prehistoric times. The northwestern area of Surin is a panhandle that juts westward into Buriram Province at the confluence of the Mun with Chi creek (Thai: ห้วยชี), which flows down from the Dangrek mountains, passing just west of the provincial capital of Surin city, and forms most of the western provincial border between Surin and Buriram. The Mun river valley forms the southern provincial border of this panhandle before extending somewhat diagonally northeast, opening up into a large lake near Tha Tum. Leaving the lake, the Mun continues on to meet the provincial border with Roi Et province just west of Road 215, effectively cutting off the mainly agricultural panhandle area from the rest of Surin. From there, the Mun river continues eastward forming the northern provincial boundary of Surin all the way to the confluence with the Thap Than creek (Thai: ห้วยทับทัน) that forms the eastern border of Surin with Sisaket Province. Due to its position in the Khorat Plateau, the climate of Surin is largely affected by the surrounding mountains which block much of the rain that would otherwise be carried to the province by the monsoons. This results in lower annual rainfall totals and greater differences between the rainy and dry seasons than areas outside the plateau. Archaeological sites in the Khorat Plateau have provided some of the earliest evidence of pottery, metallurgy and developed wet rice cultivation in Southeast Asia. The Mun river valley and surrounding basin has supported rice growing cultures since prehistoric times. The earliest settlers in the region were hunter-gatherers. The Neolithic period, which saw the introduction of agriculture, dates from 2,500 to 1,500 years BCE. The Bronze Age follows from 1,500-500 BCE, and the Iron Age from 500 BCE to 500 CE. The first evidence of human settlement in Surin emerges in the Iron Age, with approximately 60 known Iron Age sites. These prehistoric settlers are assumed to be ancestors of the various Mon-Khmer peoples prevalent in the area today. The earliest known historical period is the Dvaravati. This was an Indian-based culture, which defused through the northeast region of what is now Thailand. Evidence of this culture is found in Surin region dating to between the 7th–11th centuries CE. It was in this period that Buddhism became the dominant religion of the region. Following the Dvaravati period, the powerful Khmer Empire expanded its influence throughout what is now the southern Isan region of Thailand. This period covers the 7th–13th centuries CE. Surin was an important part of the ancient Khmer empire. Temple ruins and a substantial ethnic Khmer minority remain part of Surin. Khmer stone inscriptions date from c. 600 CE. 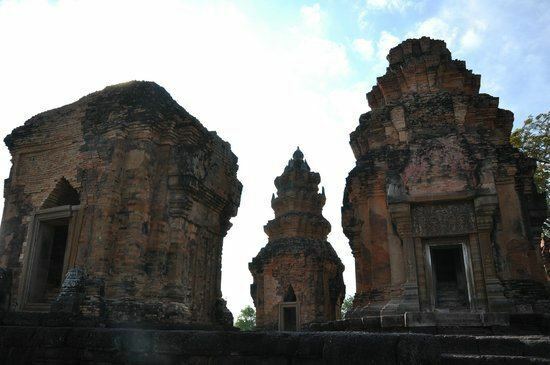 Over the next several centuries a growing number of Khmer sites were constructed in the province, most notably Prasat Sikhoraphum. These sites would have formed part of the network of Khmer infrastructure centred on Prasat Phanom Rung. With the collapse of the Khmer empire in the 13th century, Surin faded from history, not to re-emerge until the 18th century. According to legend, a local Kuay leader named Chiangpum presented a rare white elephant to Chao Phaya Chakri, the future King Rama I. In gratitude, he awarded Chiangpum the royal title Luang Surin Phakdi and appointed him village headman. When he became monarch, Rama I named Luang Surin Phakdi as the provincial governor. In 1763 Chiangpum's village moved 15 kilometers to its present location and was upgraded to a city named Muang Prathai Saman. According to tradition, the move was due to better water at the new site. In 1786 the name was changed to Surin in honor of its royal governor. The province slowly grew as people returned to the area. Although there was a continual influx of people from the surrounding areas, Surin was largely self-sufficient and remained somewhat isolated until the arrival of the railroad in 1922. Chinese and Indian merchants settled in the city, manufacturing increased, and Surin gradually became a modern metropolis. In Thailand's 2000 census it was reported that 99.5 percent of the province's population were Thai nationals; 29.3 percent of the population ranged from age 0-14, 60.9 percent ranged from 15-59, and 9.8 percent of the population is 60 and over. Surin is a province with a sizable Northern Khmer population. It was reported that 47.2 percent of the population are capable of speaking the Khmer language. This is down from the 1990 census where it was reported that 63.4 percent of the population spoke Khmer. A third large minority group, the Kuy people, also reside in Surin. Also spelled "Guay", "Suai" or "Kha" (pejoratively), the Kuy are a Mon-Khmer people distantly related to the Khmer and considered by many Thais to be the aboriginal inhabitants of the region. A 1985 study found that 9.6 percent of the people in Surin were Kuy, 9.2 percent were mixed Lao-Kuy, and 3.1 percent were mixed Khmer-Kuy. Kuy people speak the Kuy language and most traditionally followed animist beliefs although a syncretic blend of animism with the local Theravada Buddhism is now more common. As in most of Isan, the primary culture of Surin is that of the ethnic Lao people who inhabit the region. Within Thailand, the preferred nomenclature for this culture is "Thai-Isan" to enforce their identity as Thai citizens and differentiate them from the Lao of Laos, but the culture of the region is markedly different from central Thais. The Isan language is a dialect of Lao, although mutually intelligible with central Thai. The Thai-Isan of Surin are associated with Lao dress, Lao-influenced music (e.g., the khene and mor lam) and Lao-style cuisine, which includes sticky rice in contrast to the jasmine rice preferred by central Thais. Due to Surin's significant Khmer population, aspects of Northern Khmer culture are also common in the province including the Northern Khmer language and their kantrum and chrieng brunh music forms. The historical impact of the Khmer on the culture of the region is evident in the numerous Khmer temples and ruins that dot the landscape of Surin. As the Khmer prefer jasmine rice, much of Surin's rice production is geared toward this crop. 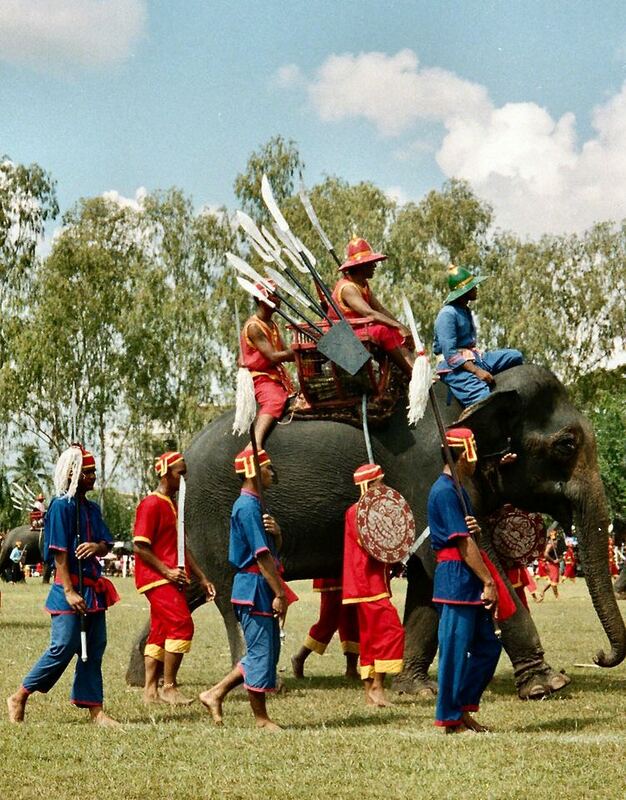 The culture of Surin is also strongly influenced by the Kuy people, most visibly in the activity surrounding elephants that is so prominent in the province. Surin is the source of approximately a quarter of all domesticated elephants in Thailand and the capture, training, and raising of these elephants is conducted by people of Kuy ethnicity. This is such an important activity to Surin and a source of pride to the Kuy people, that celebrations such as Thai Elephant Day (Thai: งานวันช้างไทย) and the Surin Elephant Round-up are held annually on the second and third weeks, respectively, of November. The festivals include light and sound shows describing the legends of the Thai elephants and a fair at Si Narong Stadium featuring parades, floats, contests such as tug of war between elephants and men and demonstrations of war elephants. Surin Jasmine Rice and Silk Cloth Fair. งานวันข้าวหอมมะลิอินทรีย์และมหกรรมผ้าไหมสุรินทร์. Held every January, the fair features agricultural product competitions, silk cloth, and presentations from governmental institutions. Surin International Cultural Exchange. (formerly known as SIFF : Surin International Folklore Festival) เทศกาลการแสดงแลกเปลี่ยนศิลปวัฒนธรรมนานาชาติ (เดิมชื่อ เทศกาลการแสดงศิลปวัฒนธรรมพื้นบ้านนานาชาติ). Heild every January by Surindra Rajabhat University. The festival features performances from many countries. Ascending Phanom Sawai Mountain Festival. งานประเพณีขึ้นเขาพนมสวาย. This annual festival is a parade of traditional art and culture to Phanom Sawai mountain, in order to pay respect to Phra Yai, the intimate Buddha’s footprint, Luang Phu Dun, and Wat Phanom Silaram. This festival is held in March. Si Khoraphum Khmer Ruins Celebration and Loi Krathong. งานฉลองปราสาทศีขรภูมิและงานประเพณีลอยกระทง. The annual celebration is held every third weekend of November at Si Khoraphum Khmer Ruins. The celebration features performance, lifestyle of ethnic people (Khmer, Lao, and Suay), local performances, souvenir market, beauty contest, Krathong contest, and floats. Eel Festival. เทศกาลงานปลาไหล. The fair is held at the field of Amphoe Chumphon Buri every third week of December, after the harvest when eels are big enough to catch. Farmers normally can catch lots of eels at that time. Ordination parade on elephant’s back. งานประเพณีบวชนาคแห่ช้าง. This tradition is held mostly on the 13th-15th day of waxing moon of May (around mid-May) at Wat Chaeng Sawang, Ban Ta Klang, Amphoe Tha Tum. Khmer, Laotian, and Guay peoples are all Buddhist. All families wish their sons to enter monkshood and study dhamma before wedding. Ordination of many monks at the same time and parade on elephant's back in long distance means great merit for all families. As all participants always dress up beautifully with mat-mi silk, the tradition earns lots of interest and inherited for generations. The parade includes more than 50 elephants crossing Moon River. The men entering monkshood will have their heads shaved, and pay homage to Chao Pho Wang Thalu Shrine before starting the ordination. Long Boat Racing Festival. งานประเพณีชิงถ้วยพระราชทาน. Organized in October every year. Four types of racing for the royal trophy and the contest of boat beauty parade will be organized on Maenam Mun in front of Wat Pho, Amphoe Tha Tum. The provincial seal is an image of Indra atop his celestial white elephant, Airavata which is based on the design found on a famous Khmer temple in the province. Both Khmer temples and elephants are commonly found in Surin. The provincial tree and flower is the common tembusu (Fagraea fragrans). The province is subdivided into 17 districts (amphoe). The districts are further subdivided into 158 subdistricts (tambon) and 2011 villages (muban). City Pillar Shrine. ศาลหลักเมืองสุรินทร์. The shrine is the sacred icon, the tutelary deity of the city and the province. Prior to 1968 the shrine did not house a pillar. This changed in 1968 when the Thai Fine Arts Department designed a new city shrine. A city pillar for this new shrine was made from a golden cassia log, donated by a Mr. Prasith Maneekan. A new shrine is under construction c. 2010. The Monument of Phaya Surin Phakdi Si Narong Changwang (Pum). อนุสาวรีย์พระยาสุรินทรภักดีศรีณรงค์จางวาง (ปุม). This is a statue of Surin's traditional founder and first mayor, Phaya Surin. The black, brass statue is 2.2 metres high, and was dedicated in 1968. The statue is at the southern entrance to the city, at what is now a major traffic round-about, but was in the past the inner wall of the city. Pum stands on a high plinth, and is depicted holding a curve-bladed pike in right hand. This is a traditional device used to control an elephant. The pike reflects his legendary skill in controlling war elephants, and recognises the important of the role of elephants in both the history and economy of Surin. Wat Burapharam. วัดบูรพาราม. This ancient Buddhist temple was built by Surin's first mayor Phaya Surin Phakdi Si Narong Changwang. The wat houses a Buddha image of Luang Pho Phra Chi, which was built at the same time as the temple. Surin National Museum. พิพิธภัณฑสถานแห่งชาติ สุรินทร์. The Surin National Museum was established in 1974. It was first housed in the Surin City Hall, but was later moved to the Surin Education Office. In 1992 the Thai Fine Arts Department proposed a dedicated museum building for the province. Construction of the museum began in 1995, and was completed in 2010. The museum is now in Ban Nongtao, Chaniang sub-district, Mueang district, on Hwy 214. The museum covers five topics: natural science, history-archaeology, local history, ethnology, and local heritage. Lower Isan Art and Crafts Centre. ศูนย์ศิลปาชีพอีสานใต้. On a bypass road, close to Tambon Nok Mueang Administration organization, southeast of Surin city. The centre displays art and culture exhibits of lower Isan. Huai Saneng. ห้วยเสนง. Huai Saneng Reservoir has a high and steep crest. 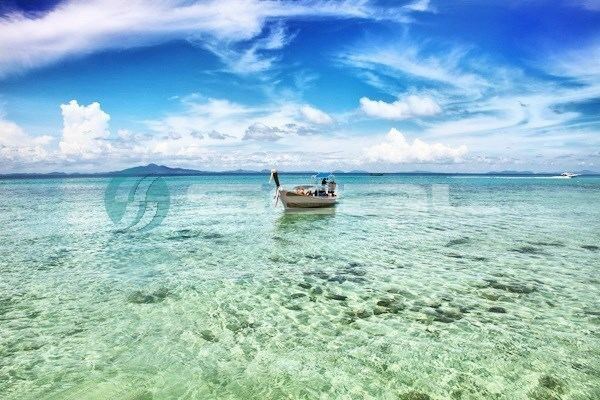 Its southern area has a rich display of water lilies and flocks of birds. The palace of Mother Princess is located in the headquarters of Phanom Sawai Forest Park. วนอุทยานพนมสวาย. The park has a hill with three peaks. The first peak, Yot Khao Chai, or the Man Peak, is where Wat Phanom Sawai is located. The second peak, Yot Khao Ying, or the Lady Peak, houses a medium-size Buddha image. The third peak, Yot Khao Kok, houses an octagon pavilion. Mueang Thi Khmer Ruins. ปราสาทเมืองที. Built from brick and cement, these Khmer ruins comprised 5 stupas on a base, with the largest in the middle and the rest at 4 corners. One stupa at the corner has completely damaged. Ban Buthom Basketry Village. หมู่บ้านจักสานบ้านบุทม. The village is famed for its rattan basketry. The basketry is a major complement to the income the village derives from agriculture. A notable feature of the basketry is that the villages do not paint lacquer on the finished product, which may cause the growth of fungus, but soak their basketry with lemon, carambola, or kaffir lime to make it glossy. Village of Chansoma Golden Brocade, Ban Tha Sawang. หมู่บ้านทอผ้าไหมยกทองจันทร์โสมา บ้านท่าสว่าง. The village is highly recognised for its 1,416-heddled, gold-brocaded silk, being offered to Her Majesty the Queen. The outstanding performance of the village is that it was selected by the government to weave cloth for the shirts of 21 APEC leaders and the shawls of their spouses. Khwao Sinarin Handicrafts Village. หมู่บ้านหัตถกรรมเขวาสินรินทร์. The community is famed for local-style silk cloth called "Hol" which is considered the best silk sloth. Ban Chok village is the first village to produce silver buttons called "luk pa kueam" which is used as decorations for ladies. Ban Phlai Khmer Ruins. ปราสาทบ้านไพล. Three brick stupas in the same line are surrounded with moat except on the east. Although Shiva Linga and some lintels are missing, the remaining artifacts are kept at Phimai National Museum indicate that the Khmer ruins were built in the 11th century. Ban Phluang Khmer Ruins. ปราสาทหินบ้านพลวง. A small sanctuary, but with excellent stone carving. Facing east, the single stupa stands on large rectangular laterite base. The main door is real, while other three are false doors. The stupa is built from laterite, sandstone, and brick. Ta Muean Group of Khmer Ruins. กลุ่มปราสาทตาเมือน. The Khmer ruins comprises three stupas in the same area. Ta Muean Khmer Ruins. ปราสาทตาเมือน. The sanctuary in Bayon Art style is built from laterite, like other architectures of King Chaya Varaman VII found in Thailand. A few Buddha images in the attitude of meditation in the niche are found here. Ta Muean Tot Khmer Ruins. ปราสาทตาเมือนโต๊ด. The sanctuary includes a principal stupa, made from laterite and sandstone, in a square shape with front balcony. Like other Khmer hospital's shrines, there is a pond outside the wall. Ta Muean Thom Khmer Ruins. ปราสาทตาเมือนธม. The biggest sanctuary in the group comprises three stupas with the biggest at the mid and smaller ones on each side. Chong Chom Checkpoint Border market. ตลาดการค้าชายแดนที่ด่านช่องจอม. The market has long been a significant border market between Thailand and Cambodia. The checkpoint is an official border crossing between Cambodia and Thailand. Huai Thap Than - Huay Samran Wildlife Sanctuary. เขตรักษาพันธ์สัตว์ป่าห้วยทับทัน-ห้วยสำราญ. This is a lush area of jungle situated on the Thailand and Cambodia border. The sanctuary has an education centre for the public. From October to December, wild flowers are in full bloom. Prasat Si Khoraphum. ปราสาทศีขรภูมิ. This Khmer-era prasat consists of five prang on a laterite base, all facing east. The main and largest prang is in the centre, with the four, smaller prang at each corner. All are built from sandstone and laterite. The lintel depicting Dances of Shiva is considered the most beautiful one among those found in Thailand and Cambodia. Three sides of the prasat are surrounded by a moat. Tapiang Tia Khmer Ruins. ปราสาทตะเปียงเตีย. The rectangular stupa was constructed from bricks, and has five lotus-shaped peaks. The stupa is in the Laotian-style, which dates it to the late Ayutthaya period (Tapiang Tia translates as duck pond). Phum Pon Khmer Ruins. ปราสาทภูมิโปน. The Khmer ruin comprises 4 stupas, 3 made from bricks and one made from laterite. The biggest and the northern stupas are the oldest Khmer ruins found in Thailand, around the 8th century. Yai Ngao Khmer Ruins. ปราสาทยายเหงา. This Khmer ruin consists of two stupas facing east, and standing in a north-south direction. The brick stupas stand on a laterite base and are decorated with carved brick gable, which depict the mythical creature, a ‘Makorn’. The Makorn is a legendary animal, a chimera composed of parts from a lion, an elephant, and a fish, and holding five-headed naga in its mouth. Pa Son Nong Khu Forest Park. วนอุทยานป่าสนหนองคู. There is a clue showing that this area used to be very abundant forest in the past. There are Pinus mergusii grown all over the area, mixed with the dry deciduous dipterocarp forest. Presently, there are only small animals present: squirrels, Malayan flying lemurs, wild rabbits, snakes, doves, coucals, and myna. Hornbills have been seen on occasion. Chom Phra Khmer Ruins. ปราสาทจอมพระ. Like the majority of shrine at Khmer hospitals, it comprises square-shape stupa with balcony and a library at front. Significant antiques found include a head of Bodhisattva Avalokitesavara statue and statue of Vajrasattva. Surin Elephant Village. หมู่บ้านช้างจังหวัดสุรินทร์. In Ban Ta Klang. 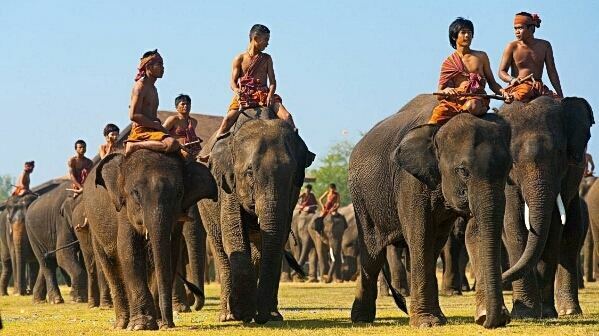 These villagers are descendants of the Suay or Kuay ethnic group, who have a long history of elephant husbandry. Unlike northern Thailand where elephants are kept for labour, Ta Klang people consider elephants as their friends who can share the same house. Surin Province is well-regarded for its production of high-quality jasmine rice. Surin is known for its high quality silk. This quality is due to a unique weaving process, as well as outstanding patterns and dyes.